Q: I dropped my tuner and nicked my soundboard. Is there a relatively easy way to patch it? I know it’s very minor, but it really bothers me. Hope this isnt too dumb a question! This certainly isn’t a dumb question, and it’s one I get asked a lot. Without seeing the damage, it is impossible for me to be certain, but my general inclination is to try to discourage people from doing their own touch-up work. It is very easy to make a nick like that look worse by trying to fix it if you don’t have the skills and experience. My advice would be either to live with it or talk to a qualified touch up expert. 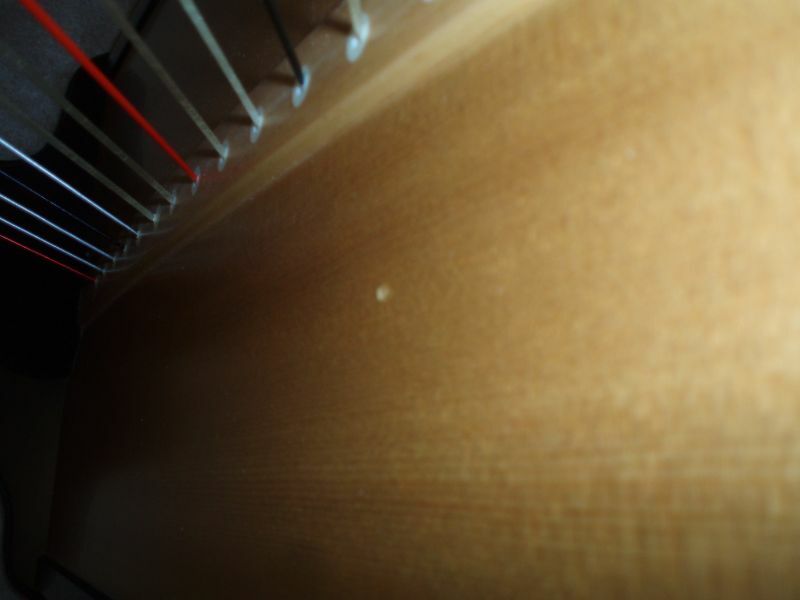 You should be able to find someone in your area by contacting piano tuners (you can search for them through the national Piano Technicians Guild website at ptg.org) and asking who they recommend. Piano Technicians will often have a better handle on local experts such as these than us harp technicians, who travel all over. I recommend locating a piano technician through the Guild because its members subscribe to a code of professional ethics and they are often the most skilled and knowledgeable technicians in their areas.